The BABOR Aftersun Repair Fluid delivers instant relief from sunburn while helping to calm and moisturise skin with intensive active ingredients. Rapidly absorbing, the concentrated treatment contains an advanced cooling complex of Phragmites Karka (Common Reed) and Poria Cocos (Indian Bread), which work in synergy to strengthen skin’s natural defences while seeking to prevent inflammation. The addition of Rosemary, Sugar Cane and Sugar Beet extracts help to even and calm red tones, leaving skin looking and feeling more comfortable and soothed. 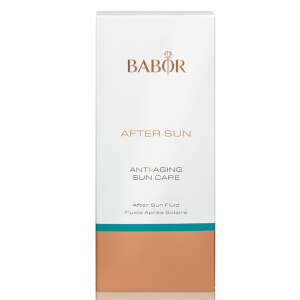 Apply After Sun Fluid generously after sun exposure to calm the skin. Shake the ampoule and wrap a tissue around its neck. Hold the ampoule firmly, and with a sharp movement snap it open at the lower, colored ring. Alternatively, use the enclosed ampoule opener. Pour the fluid into the palm of your hand and smooth evenly over the face, neck and décolleté. Pat gently into the skin (do not massage it in) before applying a moisturizing cream. Aqua, Polyglyceryl-5 Laurate, Helianthus Annuus Seed Oil, Betaine, Methylpropanediol, Panthenol, Phenoxyethanol, Parfum, Acrylates/C10-30 Alkyl Acrylate Crosspolymer, Ethyl Ferulate, Polyglyceryl-5 Trioleate, Menthyl Ethylamido Oxalate, Ethylhexylglycerin, Sodium Hydroxide, Rosmarinus Officinalis Leaf Extract, Sodium Benzoate, Poria Cocos Extract, Phragmites Kharka Extract, Pantolactone, Disodium Uridine Phosphate, Tocopherol, Citric Acid.